NOVEMBER 2, 2017 PHOENIX, AZ- In conjunction with the upcoming Grand Prix of Scottsdale, Victory Brewing Company and Hensley Beverage Company are proud to announce the specialty release of Victory Home Grown New American Lager, available for the first time on the US West Coast. In addition to 2 Victory Brewing Beer Gardens at the 2017 Grand Prix, Victory has partnered with 12 different craft beer bars near and in Old Town Scottsdale that will feature the Victory Home Grown New American Lager in celebration of the 3rd Annual Grand Prix of Scottsdale. Make sure to look for Victory Home Grown New American Lager in Arizona during November of 2017! Victory Home Grown New American Lager is made with six varieties of whole flower hops, packing this crisp, drinkable lager with bold and juicy flavors. Launching nationally in 2018, Arizona consumers will have first crack at an aromatic lager without the IPA bitterness that some India Pale Lagers might carry. 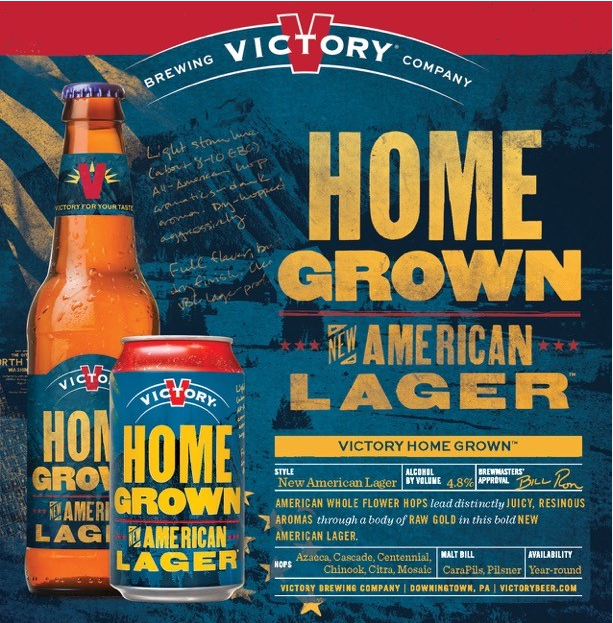 A new way to bridge lager and IPA consumers, Victory Home Grown New American Lager is aromatic up front, but drinks clean and refreshing like a lager beer, finishing crisp without a lingering aftertaste. Includes 2 Victory Beer Gardens, featuring Victory Home Grown New American Lager, Golden Monkey, Prima Pilsner, and Hop Devil IPA.